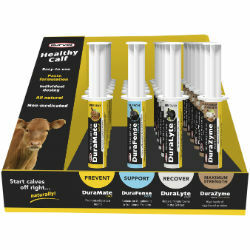 Durvet’s Healthy Calf 24 count display contains four (4) all natural paste formulated products, designed to promote digestive health and supplement new calves. PREVENT with DuraMate Calf to promote digestive health. SUPPORT with DuraFense Paste, a colostrum supplement with functional proteins. RECOVER with DuraLyte Calf to help eliminate toxins in the GI tract. MAXIMUM STRENGTH DuraZyme Paste with high levels of egg-based proteins.